Oats is a healthy way to kick-start one’s day and I try to include it in our diet in many ways. And this is one more recipe to add oats to your diet with numerous beneficial grain Quinoa. 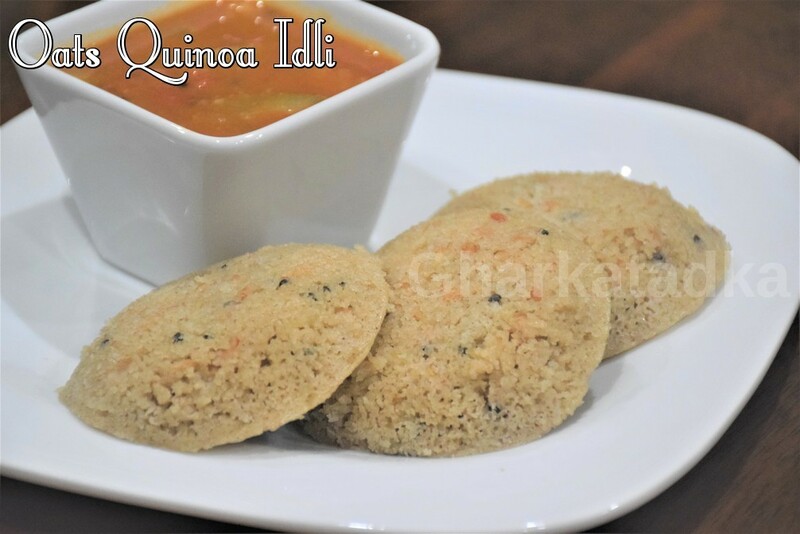 A healthy steamed oats-quinoa idli is very nutritious and gives you the energy which is needed to kick-start your day. Oats idli can be an ideal healthy breakfast option. So, learn how to make instant super spongy and delicious oats-quinoa idli at home. Dry roast Quinoa and Oats and keep it aside to cool down. After its completely cool down crush into a grinder and make powder. Take yogurt in a pan and make thick buttermilk to adding enough water. Add Quinoa and Oats powder and mix well. Make sure there are no lumps in it. Dry roast suji and add into batter. Mix well and make a thick paste adding more water if needed. Add salt and ginger paste and mix well. Heat oil in small pan. Add urad dal and roast on low flame till it's light brown in color. Mix this tempering into idli batter and mix well. Cover it and keep in a warm place for 3-4 hours. On a high flame, bring enough water to boil in an idli steamer or a pressure cooker, grease your idli plates. Separate better in another bowl which is required for one lot of Idlis. At the time of making Idlis sprinkle Eno on the separated batter as needed and pour little water on it. Leave it for few seconds, then mix well. Pour this into the idli molds. When the water begins to bubble and steam up, place it in the steamer. Steam for 12-15 mins on a high flame. Remove the idli plates and set them aside for 3 to 4 mins. Remove the idli and serve with Sambar and Coconut Chutney.